In the 60 years I have been watching prep football, I never have seen a lineman as good as Gene Chandler. He was fast, quick, agile and a devastating tackler. He was so fast that when he snapped the ball on punts, he would beat the ball down field and patiently wait for the safety man to catch it. And then he would crash into him with such force that he would often cause a fumble. By far the most vivid memory I have of Chandler was in the 1949 Tech-Georgia game. Tech had punted to Georgia safety man Ken McCall deep in Bulldog territory. Tech speedster Bob McCoy managed to elude Bulldog blockers – all, that is, but Chandler. Just as McCoy was about to nail McCall, here came Chandler, all 195 pounds of him. He struck McCoy from the blind side and the hit was so potent that McCoy went skyward about 10 feet. Meanwhile, McCall raced down field to set up Georgia’s only touchdown. Chandler retired in 1988 after operating his own State Farm Insurance agency for 33 years. He lives alone in Stockbridge. His wife of 58 years, Jean Schiemeyer Chandler, died nine years ago. Chandler also lost a son six years ago. He has one daughter, Sandra Key, age 55. Ernest Eugene “Big Gene” Chandler was born June 16, 1925. He spent his preteen years in Valdosta, which has spawned as many great football players as any city in America. His family moved to Atlanta when he was 13. He grew up in the Grant Park area and became a child star of the Grant Park Aces, a championship sandlot team. As a freshman at Tech High School, he won a place at center and linebacker on the varsity and by the time he was a senior he won a place in prep football history. He was chosen on the All-City, All-State and All-Southern teams. In 1943 the Atlanta Touchdown Club named him Lineman of the Year. He was inducted into the Georgia prep sports hall of fame. Throughout his Tech High career, he walked to and from school every day, a round trip of some six miles. In the summers he worked first as a bag boy at the old A&P grocery, then as a laborer for a construction company. Chandler could have chosen to play college football anywhere in the Southeast but he had his heart set on Georgia, much to the regret of the Georgia Tech coaches. World War II was in full blast when Chandler graduated from Tech High in June of 1944. He spent two years in the Navy before beginning his remarkable collegiate career. With a bunch of newly discharged servicemen headed for Georgia, the Bulldogs were loaded. But no one could stop the freshman Chandler from earning a starting job. It was the two-platoon era and Chandler played two years as a linebacker and two years as a defensive end. He played on three consecutive bowl teams. He was an awesome sight. Down low, head up, he was like a snake, coiled and ready to strike. 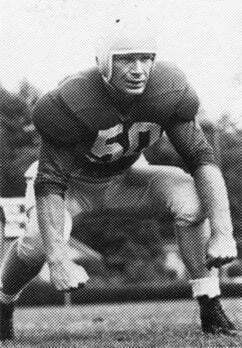 He fought off or evaded the best blockers in the SEC and was named most valuable lineman on the 1949 Bulldog team. I have one more memory of Chandler. As tough and rough as he was on the football field, he was always a gentleman off it. Walking down the Tech High hallways, he spoke to students and teachers alike, many of whom were dumbfounded that they got a warm, friendly greeting from Tech High’s greatest football hero.